Speakers at the book launch: Prof. Timothy Bonyhady (ANU), Mr. Igor Bartho (Ambassador, Embassy of the Slovak Republic), Dr Anna Rosenbaum (author); Dr Melissa Lovell (Freilich Foundation), Mr. Ondrej Bohac (Chargé d'Affaires, Embassy of the Czech Republic), and Dr Jim Jupp (ANU). 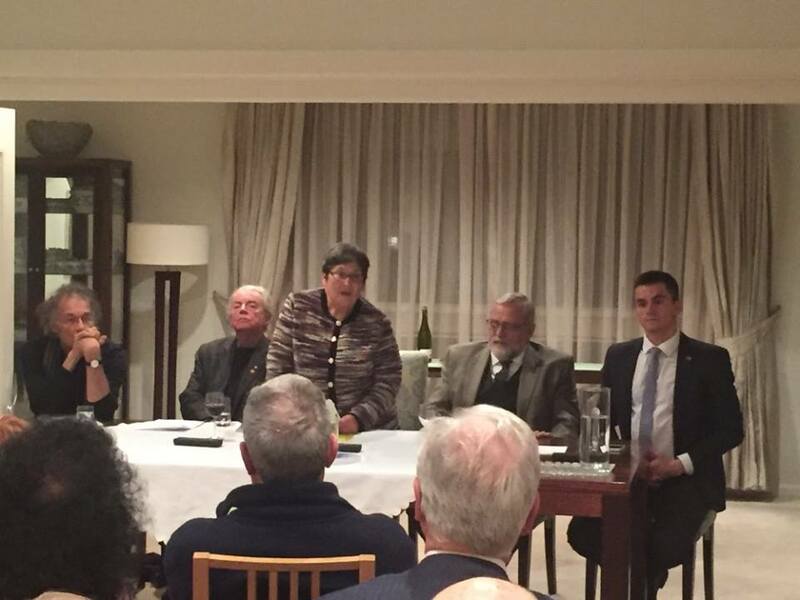 This evening members of Canberra's Jewish, Czech and Slovak communities met with academics and other interested parties to celebrate the Canberra launch of Dr Anna Rosenbaum's book 'Safe House Down Under: Jewish Refugees from Czechoslovakia in Australia 1938-1944' (2017). Dr Rosenbaum's research highlights the politics and consequences of the Munich Agreement for Czechoslovakia as well as Australia's role in these important international events. Although the Munich Agreement and the occupation of Czechoslovakia has been a subject of extensive academic debate, the role of the Australian government in this international event has not previously been examined. This book draws extensively on archival materials to evaluate many aspects of Australia’s approach to the crisis, showing the Commonwealth’s general support of the policy of appeasement, and the reaction of specific institutions and constituencies, including the political leadership and opposition, individual members of the Federal Parliament, NGOs, labour councils, women’s organizations, newly established refugee organizations, of the media, the churches, the Australian Jewish Welfare Society and the wider Australian public. Moreover, the book provides detailed accounts of the more wide-ranging dimensions of the crisis and its aftermath: the economic repercussions of the interruption of trade relations between Czechoslovakia and Australia, the activities of Czechoslovak diplomatic representatives in Australia, as well as the attitude of Australian authorities towards the Czechoslovak government in exile in London, the Australian government’s immigration policy concerning the admission of Jewish and non-Jewish Sudeten German refugees, the struggles of Czechoslovak refugees to reach the safety of Australia, and their participation in Australia’s war effort. After the demise of Czechoslovakia in March 1939, the Jewish population fell victim to Nazi persecution. Hoping to find a safe haven elsewhere in the world, some Czechoslovak Jews turned to Australia to seek refuge. With evident fondness for 'her' refugees, Dr Rosenbaum spoke at the launch about the process of tracking down and conducting face-to-face interviews with surviving refugees. These interviews highlighted the personal stories, experiences and insights of these new Australians including their escape from life-threatening situations, their journey and arrival in Australian and integration into Australian society. 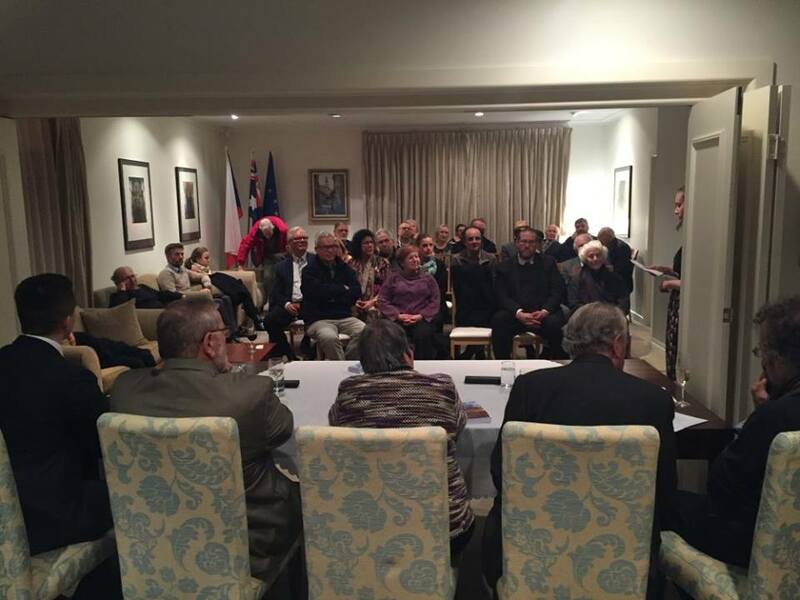 The Freilich Foundation thanks the Embassy of the Czech Republic for hosting the book launch, as well as the speakers who spoke so informatively about the book and the ongoing relationship between Australia and the Czech and Slovak peoples. Thank you Mr. Ondrej Bohac (Chargé d'Affaires, Embassy of the Czech Republic); Mr. Igor Bartho (Ambassador, Embassy of the Slovak Republic); Dr Jim Jupp (ANU); Prof. Timothy Bonyhady (ANU); and Dr Anna Rosenbaum. 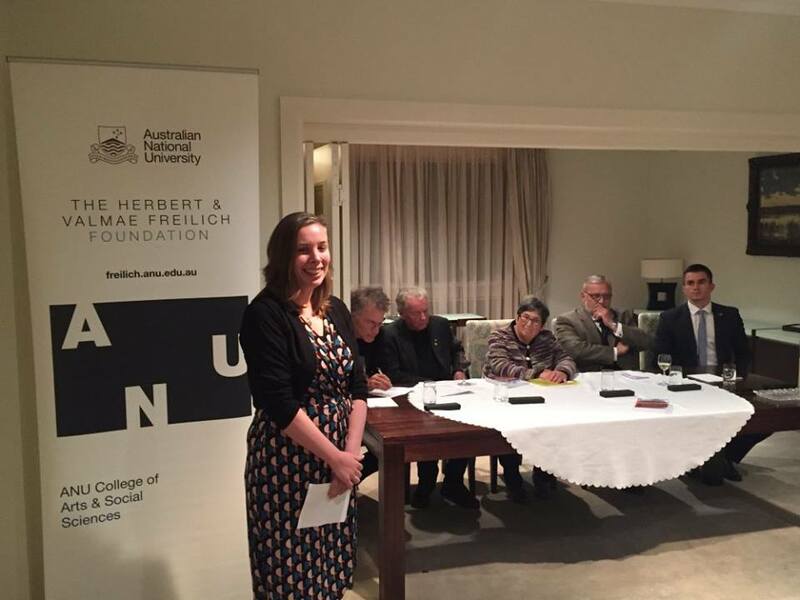 The evening was chaired and organised by Freilich Foundation Convenor & Research Fellow Dr Melissa Lovell. The book can be purchased from a range of retail outlets. Photos of the book launch.